Episode 45 – Mayday (Part 2) | No, YOU Tell It! Kicking off the second half of our “Mayday” show, recorded live at The Astoria Bookshop on May 10th, Ryan Holmes performs. Left: Ryan Holmes and Angela Cobb. 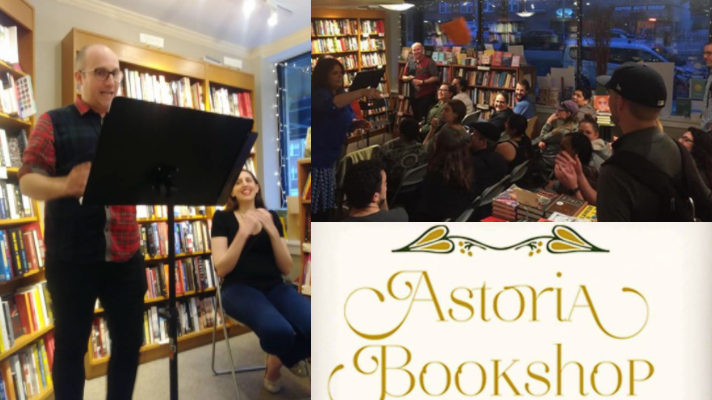 Right: Great crowd at The Astoria Bookshop. Now, switching it up, the narrator of our next story finds his inability to refuse another wedding invitation leading to a series of embarrassing social interactions, forced mirth, and ultimately, a dark conclusion. Here’s Angela Cobb performing “Terror in Virginia” written by Ryan Holmes. Ryan Holmes is the host of the Internet radio show and podcast, BlazinRy Radio, visit http://blazinryradio.com or download the podcast for free at http://bit.ly/blazinryitunes.